Greetings! If you like what you see, then click on "Book Now" button to check pricing and start the process of making Instant Reservation. Before you are asked for payment/ credit card details, you will see our all-inclusive price. It includes everything EXCEPT Pet Fees. If you plan to bring any dog/ cat, please first inform us with details of your pet and get approval for your pet. We offer the most value-for-money vacation home rental in the area. Our 3 bed 2 bath 1,250 sqft newly-furnished resort-style luxury condo at Windsor Hills Resort offers you 'home away from home' experience. It offers you the ability to relax and unwind in an informal setting with the amenities of an upscale hotel. We are conveniently located at 2 miles (3 kms) from the gates of Magic Kingdom (Disney World). Our condo is on second floor, just a few hops on stairs; however we have elevators in case you want to take it easy. 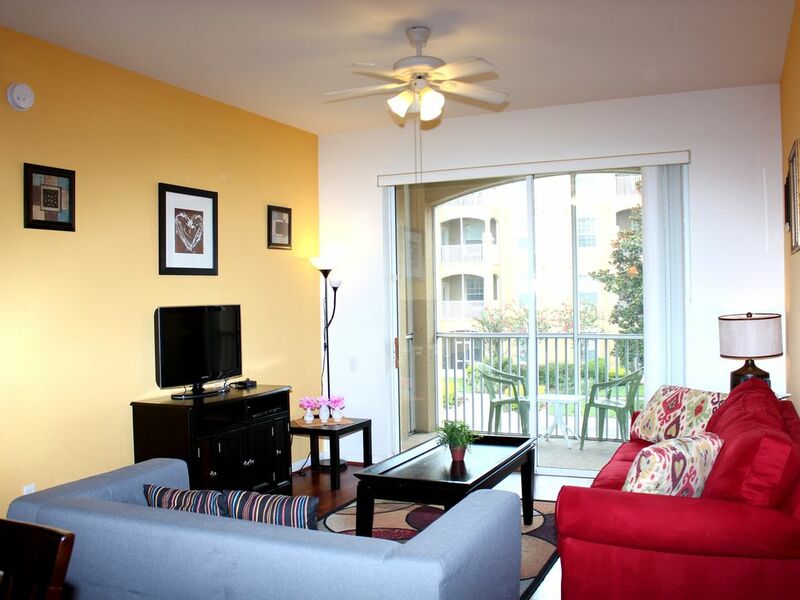 Our condo has several attributes typically not found even in the most expensive hotels/ resorts. For example, master bedroom, living room and kids room have private LCD TVs, all beds have plush memory-foam mattresses, the kids LCD TV has DVD Player connected (so they can watch a cartoon movie while adults can watch another movie). We have provided a high-quality stainless steel refrigerator that has in-built water-filter for your safety. We have free high-speed wireless internet for our guests. Why we went overboard in furnishing our condo? : We did it, so we could enjoy whenever we visited. And we will be happy to offer it for your enjoyment. We have a local Property Management Company take care of the property. They are available on 24 x 7 basis for any emergency. The Clubhouse staff is very friendly and will be happy to provide you with any information/ assistance. This gated resort-community is secured through single-point entrance and Security personnel. Approx 1 week before your Check-in Date you will receive the Access Code to electronic lock on our condo door. Upon arrival at the resort you will need to show your Driver License/ Passport and obtain a parking tag for the duration of your stay. Then you go to the condo, just punch in your Access Code and the door unlocks. Once you are inside, it automatically locks the door after a few seconds. No hassle of picking up physical keys from some other location only to lose the key in pool/ park. Most of our guests find out about us through positive word-of-mouth or through friendly invitation from us. This is our first year of listing at HomeAway. Our goal is to make your stay with us a memorable and comfortable one (so you can tell others about us). Optimal Growth LLC owns and operates several luxury condos near Disney/ Orlando area. We have been serving guests since 2010. We fell in love with Orlando at our first visit. We loved the weather, the clear blue sky, Disney theme parks and the relaxed attitude of residents and tourists. Over 2 years we looked around for a resort community that gave us a sense of safety, comfort and convenience. We found it all at Windsor Hills Resort. Retail is all about 'detail'. So we focus on big as well as small things that can create positive impact on your overall quality of stay. We offer you luxury experience at value-prices. Proudly serving Orlando/ Disney guests for over 4 years! I really, really enjoyed the area of Windsor Hills! Gated community, pool, water slides, convenience store, and a lot of outdoor space for walking, volleyball, basketball, etc! This particular condo was nice. It had some very minor issues (screaming shower in one bathroom, damage from a dog in one bedroom, and other insignificant things), but overall it was quite nice. Cable included, had some dvds, nice fridge, all the kitchen appliances and dishes you really need, screened in balcony was great! Extremely close to a Walmart, several restaurants, gift stores, and rather close to Disney World! Prem was very helpful and attentive when needed. We overall very much enjoyed our stay, I would stay here again! A fun stay, close to the parks. The drive to Animal Kingdom (10 min) and Magic Kingdom (15 min) were pretty simple from this location. Plenty of restaurants, markets and shops located within minutes. A Walmart Super Center, with gas station was there, but not open yet (as of Nov 207). But it'll be the best option for one stop shopping from this condo. Overall, we had a great stay and would pick this place again if we traveled to the area again. We loved our family holiday. The apartment was a great base. Good facilities in the communal area, very helpful staff. I cannot rate this condo on the good side. The picture is not what the condo looks like. There are no leather couches or love seat. The mattress in the second bedroom is hard as a rock and the TV only can play DVD's. There is no cable in there. There were dirty glasses and food left in the cupboards. We found a dirty sock from the previous people. the whole condo needs updating. The blinds in the living room are cracked and the molding in the bathroom needs to be painted. There are more things but, I have pictures. The pool is not very convenient for children. I will not be staying at Windsor Hills. This is the first place we have stayed that hasn't been good. Windsor Hills is consistently reviewed by most guests as the # 1 resort in the Disney area. We are booked year-round and unless guests make advance booking, we don't have availability. The second bedroom does not have cable TV connection throughout the resort (builder mistake). One cannot rectify it without creating tripping hazard, so we have kept a LCD TV, DVD player and movies in that room. Cable connection is available in the other two rooms as well as in the Living room. The pool is the main feature of the resort and is most convenient for children as it has beach-entry, i.e. very gradual slopes. It also has a water-slide that's loved by both kids and adults! Great location in a great community, especially if you are doing Disney world. We were universal and it was a bit longer and a hassle with traffic, but we had a couple of days activities to west as well so chose this area. Unit was fine for us, a bit basic (could have used kettle, dish cloth, dishwasher soap etc) - it mentions in manual, but we are used to getting those). Unit was a bit worn too, but rest was great. Huge + with central air so quiet AC, quiet area, good wifi. Good stay for the price! Prem's condo was wonderful. It had everything we needed. Very comfy. The resort clubhouse was excellent. The pool is incredible and the clubhouse amenities were great. It was a wonderful vacation and we enjoyed it. We will definitely be returning to this location when we come back. Prem was great about keeping in contact with our many questions. Our Windsor Hills Condo is located very close (approx 2 miles, or 3 Kms) to main gate of Disney's Magic Kingdom. The condo is located close to many golf courses and lakes. Please check with Owner if you are bringing any pet (dog/ cat). There is $100 one-time Pet Fees if pet is approved. Proudly serving guests near Disney/ Orlando since 2010!